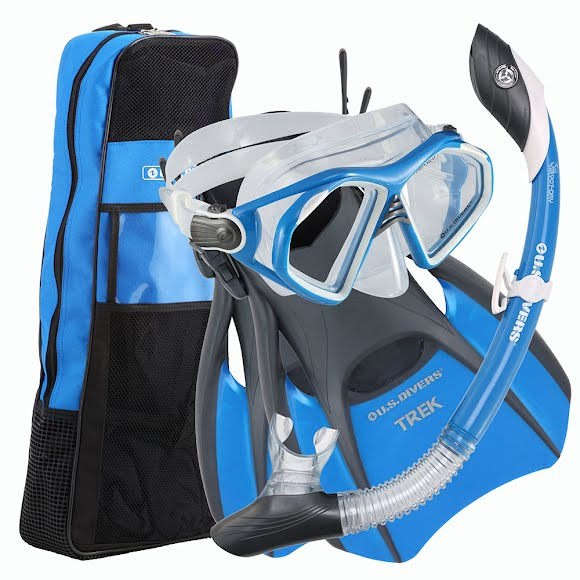 Make it a perfect beach day with the Admiral LX Mask, Island Dry LX Snorkel, Trek Fins and Travel Bag from US Divers. Colors may not match image. Make it a perfect beach day with the Admiral LX Mask, Island Dry LX Snorkel, Trek Fins and Travel Bag from US Divers. Colors may not match image. US Diver&apos;s Dry Top snorkels are designed to keep all water out of the breathing tube whether above or below the surface of the water. They act as splash guards while on the surface of the water, and close automatically when submerged to seal out any water. Dry Top technology also provides excellent unobstructed airflow and easy purge (clearing) capabilities.